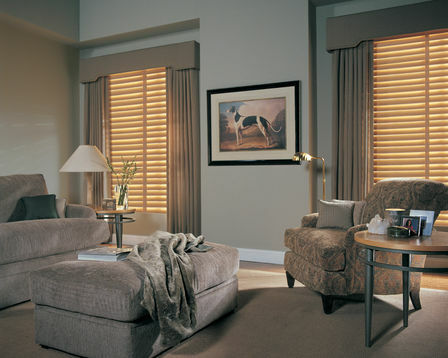 Genuine, handcrafted hardwood blinds from Hunter Douglas Window Fashions offer the greatest selection of finishes, slat sizes, operating systems, and design options for complete customization. Choose from classic colors ranging from bright white to dark wood stains, distinguished patterns and subtle textures. In addition, a wide range of alternative wood blind options that look like real wood blinds but include the added benefit of being ideal for wet areas or areas with high humidity, extreme temperatures and direct sunlight are available - guaranteed not to fade, yellow, warp or bow.